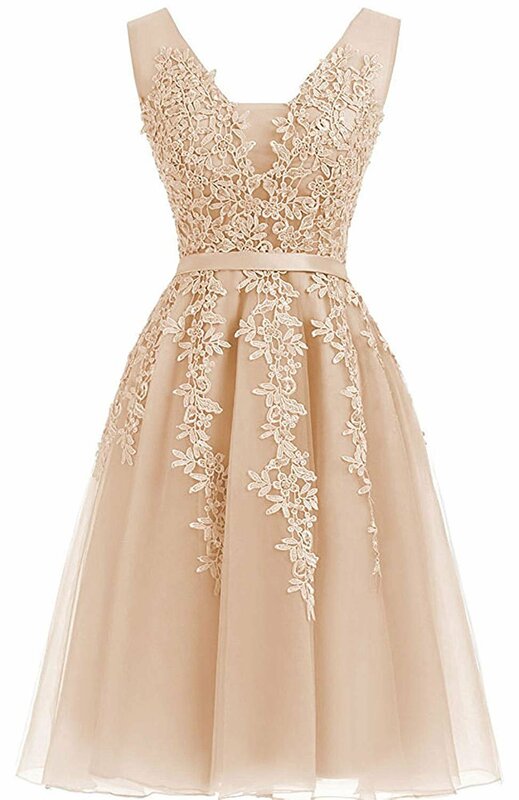 Fabric:Tulle and Lace Appliques; Item Features:A-Line, Knee Length Style, Sleeveless, V-Neckline, Zipper Back. Size Note:Different 1-3cm is allowed due to the different measurement method .When you received the items unsuitable for your body ,there have 3-5cm can be alter in your local tailor physical store. Welcome to our shop 20KyleBird.We at all times work on providing more prime quality dresses and better shopping experience. This is a prime quality tulle dress.Perfect for prom party quinceanera.Wedding dress,and other Special Occassion. We will send the dress as soon as conceivable after we receive your order! including quality problem, not the right size etc. Size Note:Different 1-3cm is allowed as a result of the different measurement method .When you received the items incorrect for your body ,there have 3-5cm can be alter in your local tailor physical store. Delivery time : 7-10 working days to make the dress, and two shipping ways:1.Expedited Shipping takes 3-5 days to arrive, 2.Standard Shipping takes 10-15 days. If you wish to have the dress urgently,please pay for the express freight and email us your deadline,we will be able to try our best to send the dress on time. Please remind that the minor color aberration would occur dur to nminor difference between the LED nad real colors,.All product is subject to the Actual dress.